Spice re-enters the smartphone market with Android One and we will take a little sneak peak onto it. Today, Android One smartphones are officially released by Micromax, Karbonn and Spice through Amazon, Snapdeal and Flipkart respectively, and here we will take a look into what Spice has got in its first Android One smartphone, after all it an almost vanished brand from the market has returned to the market with a new handset dubbed as Spice Dream Uno. The handset is not very much different from the other Android One handsets launched today, but one thing that caught our attention is the 4.5 inch IPS LED display, which will make everything look very crisp and clear. The phone has got 1.3 GHz quad core processor along with 1 GB RAM, in case of ROM, the phone has 4GB internal memory in which 2.27 GB is usable. The phone runs Android 4.4 Kitkat out of the box, However, Android L upgrade will be available for it as soon as it is released. The phone has a 5 MP snapper along with flash and a 2 MP front facing camera for video calling. Connectivity options include 3G, Wi-Fi, Bluetooth and USB, also the phone supports dual SIM (GSM+GSM). On-board sensors include proximity and light sensors. Also, the phone will come with 10 GB of free Spice Cloud Storage and will also have preloaded apps like Flipkart, Flipkart Ebook, Reverie Smartpad, Facebook, Spice Cloud, Google Drive 15 GB. We have added the full technica details below. 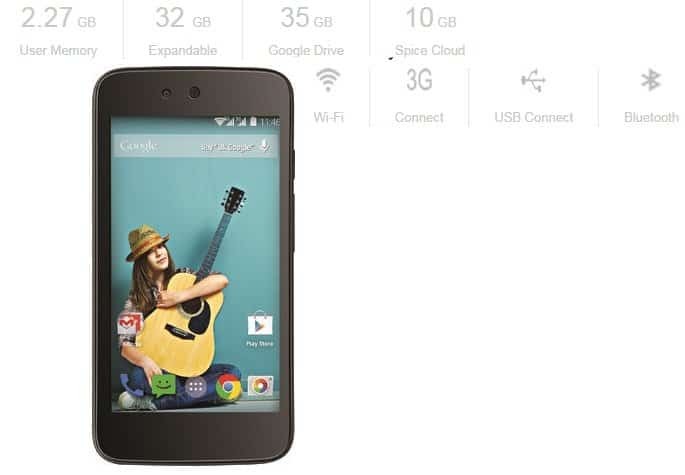 Buy Spice Dream Uno Mi-498 from Flipkart. Next articleSamsung Galaxy Note 4 vs Sony Xperia Z3 : which Smartphone to choose?